Guests of Garma 2014 will be treated to a sensational line-up of popular and emerging musical talent from across Australia, the Yothu Yindi Foundation said today. CEO Denise Bowden said the bunggul grounds at Gulkula would host a diverse array of musical styles and performances over the four nights of this year's event. “Music has always been an integral part of the Garma experience and this year's acts are sure to have Garma guests kicking up the dust on the dance-floor,” she said. Singer, song-writer, actor, director and all-round entertainer Ali Mills will open proceedings on the main stage on Friday night, followed by The Barra Band and their eclectic blend of soaring harmonies, cruisy reggae, lively ska and new renditions of traditional songs. The Sunrize Band will be the closing act on the first night, serving up what Rolling Stone once described as “a swinging Arnhem Land blend of Hendrix, Neil Young and didgeridoo”. Saturday night kicks off with the dynamic hip-hop trio Last Kinection, followed by the highenergy, high-impact show of Krazy J, the critically-acclaimed Arnhem Land band East Journey, and Diesel 'n' Dub, who present their own soulful interpretations of songs from Australian legends Midnight Oil. 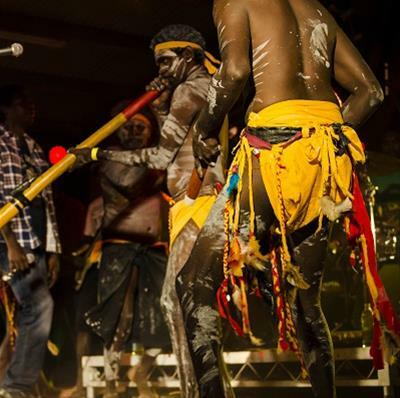 Emerging local talent Yirrmal and the Yolngu Boys are first up on Sunday night, offering a refreshing mix of traditional ceremonial songs and modern pop, while Kutcha Edwards is sure to soothe the soul with his rich, powerful voice. Hailing from one of Australia's most remote Aboriginal communities, Yilila Band will get the crowd jumping with their high-energy roots and world music, combined with colourful displays of traditional dancing that has evolved over hundreds of years of contact with Macassin traders from Indonesia. Guests will be treated to a special grand finale to close this year's Garma on Monday evening as renowned musical director Paul Grabowsky and the Australian Art Orchestra team up with the Young Wagilak Band to perform Crossing Roper Bar, a visionary exploration of the musical traditions of Australia's first people and an electrifying musical marriage of the very old with the very new.